Last Sunday they lost the Leinster final to Dublin but Meath must pick themselves back up quickly for tomorrow’s qualifier battle with Laois. Meath's Graham Reilly will be in opposition to Laois tomorrow. Latest from the medics and management…There’s just the one Laois change and given their shooting troubles in that close-run game in Carrick-on-Shannon, it’s a little surprising it’s an alteration in defence as Darren Strong comes in at wing-back, taking the place of Pádraig McMahon. At the other end of the field, the attack again remains settled with Colm Kelly continuing to impress, and that means there’s still no role for MJ Tierney who will get to add to his considerable bench time. LAOIS: Eoin Culliton (Timahoe); Cahir Healy (Portlaoise), Kevin Meaney (Arles-Kilcruise), Jamie Kavanagh (Stradbally); Darren Strong (Emo), John O’Loughlin (St Brigid’s), Conor Boyle (Portlaoise); Brendan Quigley (Timahoe), Colm Begley (Parnells); Ross Munnelly (Arles-Kilcruise), Billy Sheehan (Emo), Gary Walsh (Ballylinan); Damien O’Connor (Timahoe), Padraig Clancy (Timahoe), Colm Kelly (Stradbally). Stephen Bray is out through injury and is replaced by Cian Ward but unless Banty was bluffing last week there’ll be at least one more switch in personnel and several positional changes. Last Sunday, the manager talked about Kevin Reilly’s season being in jeopardy due to an Achilles injury. If he goes, the standard reshuffle has been to move Bryan Menton into full-back with Eoghan Harrington taking his place at wing-back. MEATH SF: David Gallagher (St.Peters Dunboyne); Donal Keogan (Rathkenny), Kevin Reilly (NavanO’Mahonys), Bryan Menton (Donaghmore/Ashbourne); Donnacha Tobin (Blackhall Gaels), Shane McAnarney (Clann na nGael), Micky Burke (Longwood); Conor Gillespie (Summerhill), Brian Meade (Rathkenny); Alan Forde (Navan O’Mahonys), Damien Carroll (Ballinabrackey), Graham Reilly (St.Colmcilles); Brian Farrell (Nobber), Joe Sheridan (Seneschalstown), Cian Ward (Wolfe Tones). Checking the odds…Only one provincial final loser has ever gotten the better of the six-day turnaround but that doesn’t stop Meath being priced at 1/2 while Laois are 2/1. Meath are two-point favourites in the handicap market while on a side note, Joe Sheridan is 11/2 for first goalscorer. You’ve been warned. Clues from the form guide…Meath seem to have turned around their season and are unrecognisable from the side that fell from Division Two and sensationally, very nearly fell against Carlow. They were excellent against Kildare, and even though Dublin were worth more than their three-point win in the Leinster final, Meath were still very good for long spells of the second half. As for Laois, we need far more proof to believe that they have turned a corner. Yes, they were surprisingly good against Monaghan and yes, they did just enough against Leitrim, but each of those wins must be taken in perspective and the standard of the opposition has to be taken into account. As for head-to-head, it took a replay for Meath to prevail on their way to a Leinster crown in 2010. The game breakers are…Joe Sheridan and how to and where to contain him. His speedy return to form after returning from the States has been exceptional and he is what will make this Meath side tick. If he can trouble Laois close to goal not only can he take a score himself, but he has the ability to attract other defenders and that will create room for the in-form Brian Farrell and Cian Ward. If that happens and Graham Reilly keeps breaking and opening up space from deep, there’s the potential for a big score. And given their full-back line, Laois will need to hope to take over in centrefield, have Reilly chasing Brendan Quigley rather than the other way around and have Colm Begley getting above Conor Gillispie. In that scenario, then Sheridan may be called into the centre where he’s still immense but at least he’s further from the posts. Gazing into the crystal ball…Last Sunday, the press pack left Banty’s press conference pumped up by his words. He was that adamant that his side would win this and be back in a quarter-final. If he has his players that pumped then there’s no reason why they can’t advance because they have the better team, particularly if Donal Keoghan continues his remarkable rise and Donnacha Tobin and Damien Carroll hit the highs they did against Kildare. They certainly have far greater scoring power as Laois for a couple of seasons now have failed to impress in front of the posts and even if they look to finally have bought into Justin McNulty’s defensive set-up, it won’t be enough. In fact they’ll have to dominate possession to create enough chances to match Meath and we just cannot see that happening. Join us tomorrow afternoon as we go live from Tullamore with minute-by-minute updates of Meath v Laois from 3.30pm. Email “Laois v Meath — All-Ireland SFC qualifier round four match guide”. 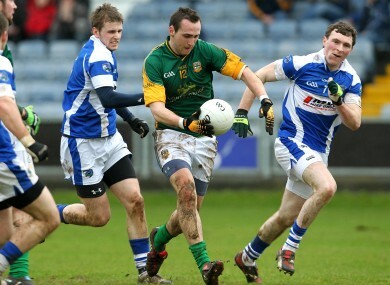 Feedback on “Laois v Meath — All-Ireland SFC qualifier round four match guide”.